It's lunchtime at your favorite eating spot! With the Green Toys Sandwich Shop young chefs can open their own imaginary deli and take orders, create sandwiches and serve guests. This 17-piece, stackable, mix-and-match play food set comes with all the fixings to create two complete sandwiches. Each realistic part is made in the USA from food-safe, 100% recycled plastic milk containers which save energy and reduce greenhouse gas emissions. Interchangeable with other Green Toys stacking play food products. Fits on Green Toys kitchen sets. 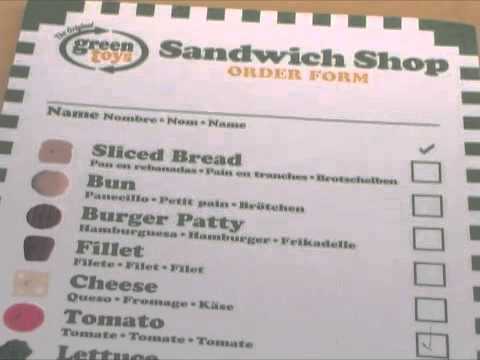 Set includes two bread slices, bun top and bottom, burger patty, fillet, two cheese slices, lettuce leaf, tomato, two sets of onions, one red pepper, one set of pickles, two plates, and a Sandwich Shop order pad. Serve up some Good Green Fun™!